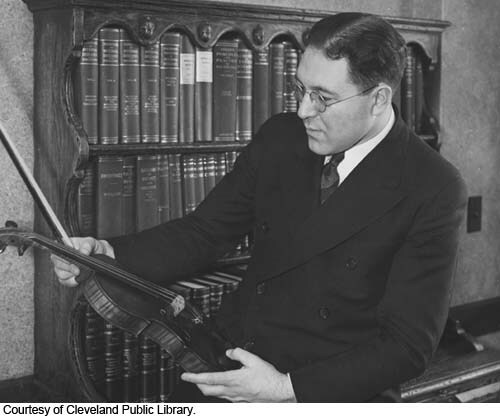 “Music is the elixir that serves as an antidote for the toxins of life, and blessed are they who may partake of this wondrous drug,” wrote Jerome Gross, respected Cleveland surgeon, who played a golden Stradivarius, performed chamber music, served as concertmaster of the Cleveland Philharmonic Orchestra, appeared as soloist with the Cleveland Orchestra and won laudatory reviews. Born in Russia, on May 15, 1904, Gross grew up in Cleveland and began studying violin at age 10. The eldest of five brothers who all became doctors and musicians, he worked his way through Adelbert College, Fordham University and the Western Reserve University School of Medicine by playing in theater orchestras and hotel string quartets. Despite the heavy demands of the medical profession, he found time to practice from one to six hours daily. At City Hospital (now Cleveland's MetroHealth System), where he was head of surgery, he practiced in the morgue, the only soundproof room in the building. Among his music teachers were Toscha Seidel and Oscar Shumsky, violin; Elwell and Joseph Schillinger, composition; and 1968 Cleveland Arts Prize winner Arthur Loesser, chamber music. Gross’s wide-ranging repertoire featured music by several 20th-century composers, including Elie Siegmeister, Schillinger and Elwell, whose Concert Suite he performed with the Cleveland Orchestra at Severance Hall under the direction of George Szell. In 1955, Gross formed a duo with his teenage son, David, a gifted pianist who became a radiologist. The father-and-son team made its debut at Severance (now Reinberger) Chamber Music Hall, playing Brahms's Violin Sonatas. Throughout his career Gross gave concerts for the benefit of numerous musical and charitable organizations. In 1953, he founded the Cleveland Friends of Music to play chamber music, provide performing opportunities for talented musicians and raise money for worthy musical students. Later the organization commissioned works from local composers. Having taught himself to speak Russian, Gross promoted cultural exchange with the former Soviet Union and established friendships with violinist David Oistrakh, cellist Mstislav Rostropovich and other renowned Russian musicians. He joined Rostropovich and his wife, the great soprano Galina Vishnevskaya, in a remarkable recital in Reinberger Chamber Music Hall.